Polyps are one of two forms of the cnidarians. The other body form is the medusa. Polyps have a vase-shaped body with tentacles around the mouth opening. Polyps may be sexual or asexual. They can all reproduce asexually by budding. In some species, the polyps can also reproduce sexually. When medusae mate, the result may be polyps, when polyps replicate, the result may be medusae. The details vary between species. Some species are polyps all the time (such as Hydra, and the whole of the class Anthozoa (corals and anemones). In many cases the asexual buds formed do not separate from the parent but remain, thus forming colonies or 'stocks'. These may reach a great size, and contain a vast number of individuals. Slight differences in the method of budding produce great variations in the form of the colonies. The reef-building corals are polyp-colonies, strengthened by the formation of a firm skeleton. 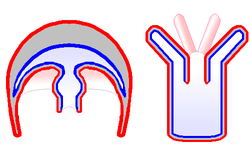 Jellyfish (class Medusozoa) have two distinct life history stages (body forms) during their life cycle. The first is the polyp stage. Often, this polyp is attached to the sea floor, or to another hard surface. 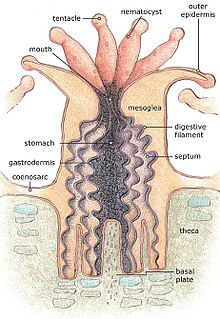 A polyp that lives that way is called sessile. In the second stage, the tiny polyps asexually produce jellyfish, each of which is known as a medusa. Tiny jellyfish swim away from the polyp and then grow and feed in the plankton. Jellyfish reproduce both sexually and asexually. ↑ Polyp in 1911 Encyclopædia Britannica, Chisholm, Hugh, ed. This page was last changed on 12 September 2018, at 19:57.